An uncanny title, isn’t it? Why would one want to write about one of the most despised minerals on the planet? And why you, the reader, should bother to read it? Because there is a lot more to sodium than what is told to us. And in this post, we look at that lot more. Read on to know what are the foods high in sodium. What Is Sodium? 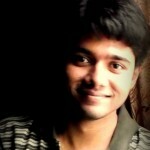 Why Is It Essential? What Is The Recommended Daily Allowance Of Sodium? How To Lower Your Sodium Intake? What Are The High-Sodium Foods To Avoid? Which Foods Contain Less Sodium? Sodium is essential. Healthcare marketing companies (some of them, we mean) have shunned sodium and tarnished its image. But guess what? Just like other minerals, sodium is also one. It is classified as an electrolyte as it carries an electric charge. And it is essential. It works with other electrolyte minerals like potassium and calcium and magnesium to balance the water levels in your cells. It even stimulates your nerve impulses and plays a role in muscle contractions. It regulates blood volume and blood pressure, thereby enhancing the health of your heart. We mean, hey, sodium is important. And oh, by the way, what are the foods high in sodium? As the values show, table salt is excessively high in sodium. You can add a pinch of it in your dishes for taste. But if you are perfectly healthy, don’t avoid table salt totally. As we say, sodium is important for health. Add a pinch of it to your dishes. This is the amount of sodium one package (or 4 oz) of dry or hard pork salami contains. 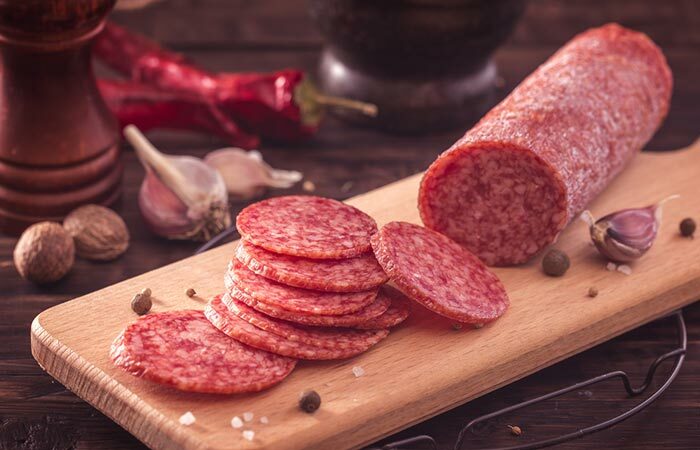 Salami also contains decent amounts of iron and vitamin B12 – which protect the immune system and boost brain health. You can use it in your breakfast sandwich. Since pickles are made through the process of fermentation, they contain a good amount of probiotics. These probiotics can improve gut health. And if they are fruit or vegetable pickles, you also have an added antioxidant advantage. Layering pickle slices on a peanut butter sandwich for breakfast can be a good start to your day. A 2005 study had found that soy sauce has anti-allergenic properties. The sauce holds great promise in treating allergies, although more research is needed. The sauce is also rich in shoyuflavones, which are natural antioxidants. You can use soy sauce as a seasoning while sautéing vegetables. 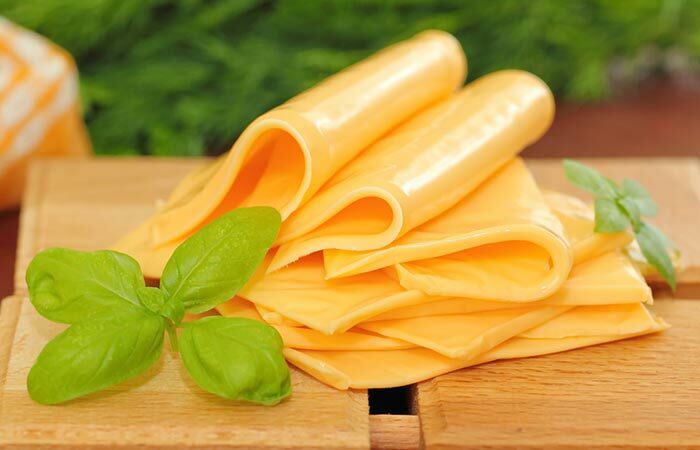 Though a good source of sodium, we advise you to stay away from processed cheese. It contains food coloring and other emulsifiers that can harm your health. You can instead go for cheese options that would have undergone less processing. Some of the healthier alternatives include ricotta or cottage cheese. Simply add cheese to your breakfast toast. Or add the slices to a salad. Just like most meat foods, ham also contains a healthy amount of protein and iron. It also contains decent levels of zinc, a mineral important for your immune system. Opting for lean ham can be a better option. You can use this ham to make a protein-rich sandwich. Or even chop it into pieces and add to your breakfast omelet. It is often called the healthy junk food. It is high in protein, and the best part about it is it doesn’t raise your insulin levels. But better check for chemical-free brands as certain others are loaded with preservatives and aren’t worth your money. Simply grate beef jerky over a fresh salad. This probably is the healthiest in the list. The vegetable is a commendable source of antioxidants and other beneficial enzymes. It also contains vitamins C and K and potent minerals like potassium and folate. Celery is mostly water, so raw celery works fine. You can also add it to your every day salad. Olives are replete with antioxidants, whose importance we cannot talk about enough. 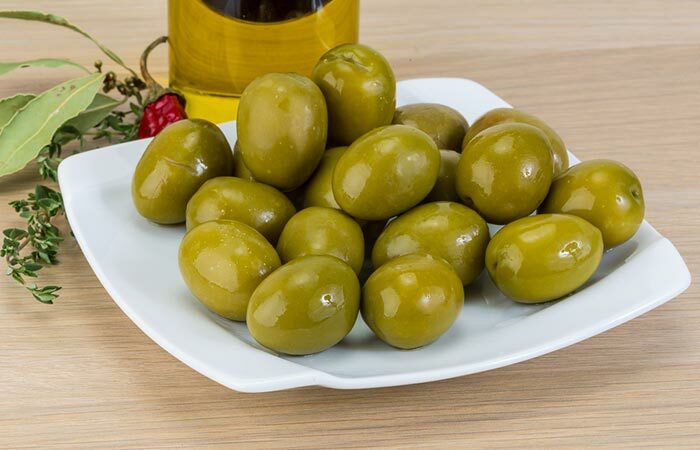 There are other compounds in olives that lower bad cholesterol and even prevent bone ailments. You can add olives to your breakfast omelet. Another vegetable in the list. And it is super-rich in vitamin K – required for strong bones. It also contains good amounts of vitamin A that is important skin and vision health. Add the veggie to your salad. Well, you saw the foods high in sodium. But wait – do you think you are getting enough sodium? How do you ensure you are getting enough sodium? By sticking to the RDA of sodium. It is 2300 milligrams or less. Which is equal to just about one teaspoon of salt. That’s it. And it is almost impossible to not get that much amount of sodium in a day. Certain groups of people, especially those with heart disease, need to reduce their sodium intake to 1500 milligrams or less a day. Sodium is important. But in no way are we advocating a high sodium intake. We assume you already are having enough sodium in your diet (like most people). Hence, it is important that you looked at the other end of the spectrum. Choose fresh fruits and vegetables over processed foods as an evening snack. Use fresh meat instead of the packaged ones. Select seasonings or spices that do not list sodium as one of their ingredients. Compare the labels of various brands of the same food, and pick the one with the least levels of sodium. Do your research before dining out. Visit the restaurant’s website and check the amount of sodium in each dish (if the info is available). You can then order the one with the least sodium once you go to the restaurant. And also, avoid foods high in sodium. What are they? We ask you to avoid all of these because excess sodium can cause serious problems. Yes, sodium is vital. But never in excess. Elevated blood pressure. 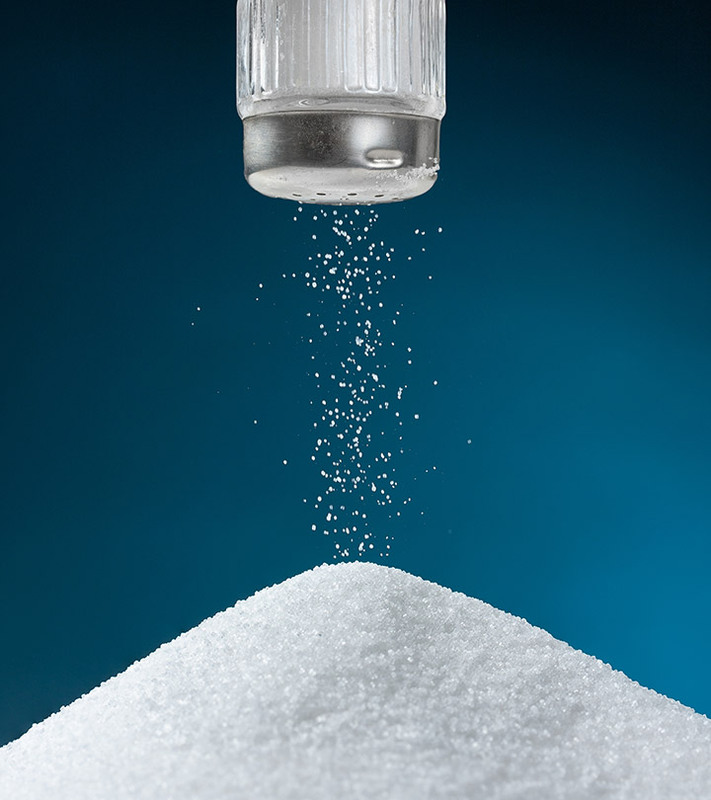 The excess sodium holds excess fluid in the body, and this puts a burden on the heart. This eventually leads to heart attacks. As per research, Higher intake of sodium can also cause stomach cancer. Osteoporosis is another disease caused by excess sodium intake. The amount of calcium your body loses through urination increases with the amount of sodium you consume. It doesn’t have to be the most despised. Really. Sodium is vital. But remember that it has its limits. As long as you remember that, you will be happy. Tell us how this post has helped you. See the comment box below? We have put it there for a reason! Cheers. How good (or bad) is sodium for fat loss? Though excess sodium doesn’t have much of an effect on fat loss, it sure can obstruct weight loss. This is because sodium intake causes you to retain more water in your system – causing an increase in water weight. 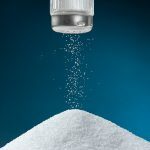 Is a high-sodium intake bad for health irrespective of the age? Absolutely. When you are young, the effects may not show right away. But yes, a high-sodium diet is bad. Are You Suffering From High Blood Pressure Or Heart Problems? Avoid These Foods At All Costs!